I was inspired to renew my vows with my number one trail shoes this evening. Cheesy? Duh. But one day you, too, will find that perfect pair of shoes with which to share the trail and will feel compelled to share just how you feel. Love is precious, so I'm getting up on top of that mountain and shouting it out to the world (blog-land)! I promise to always share the trail with you, through thick and thin, wet and dry, singletrack, fire road, crushed limestone and the occasional paved road (but not too much road because that's just wrong). 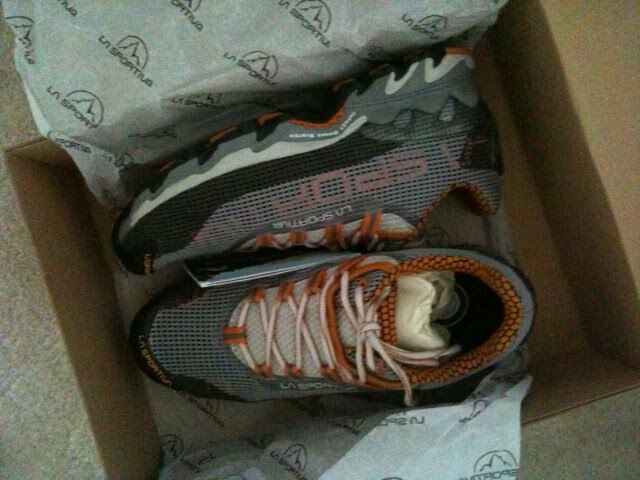 Through the good times and the bad, victories and defeats, you will always be my number one trail shoe. Look at you, with your perfect autumn/Halloween colors, you are all but begging me to lace you up and take you for a spin. How adorable are you?! My very first pair of Sporty Cats were there for me along that winding and rooty trail in Huntsville, Texas, through all those tough long training runs at Palos and Waterfall Glen, through the seemingly endless stream crossings out of Twin Lakes, up and over Hope Pass in Winfield, Colorado. 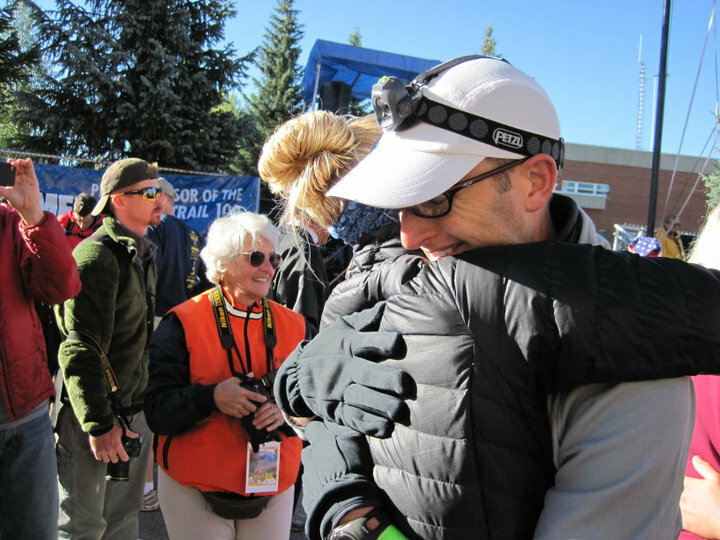 You shared the triumphs with me, and you hugged my feet tight as I swallowed the bitter pill of my first DNF ever. You were there for me, and held up at the seams (literally), draining quickly and allowing me to run (and death march) with dry feet. Sporty Cats, you always seem to know just what I need, when I need it. My (nearly) blister-free feet thank you each time I lace you up, and my Drymax Max Pro socks are the perfect compliment to your slightly wider toe box, snug heel cup, sewn in tongue and ballistic rock shield. Speaking of which, I'm all packed! This is a first, it should be noted in some sort of diary that is kept in some kind of historical records department in a maximum security library. It's kind of a big deal. Last Friday night, Geof and I decided to work on our race nutrition and ended up spending the entire evening packing all our nutrition, portioning out individual servings of Perpetuem and Gatorade for the crew vehicle and our drop bags. Portioning out gels, chews, gum and tasty delights. And, heck, why stop there? We then decided to organize our drop bags with everything we planned on having in them. Flashlights, headlamps, batteries, foot care, soap, towels, sunscreen, bug spray, Starbucks Doubleshot, food, gum, music, gloves, changes of clothes, shoes, hats, Bodyglide, socks... Geof stopped at one point, mid-portioning of a baggie of Perpetuem,"I bet we are the only couple in the country spending their entire Friday night putting together race nutrition, a week in advance. And enjoying it!" I bet he was right. RecoFIT will keep me compressed, warm and hopefully not all puffy! I should mention I have run a whopping 6.2 miles in the last 6 days due to that nagging adductor issue of late. I don't know if it's mostly my mind doing its usual pre-race jitter dance on me, but I'm not too keen on getting hurt before the big dance, so I opted to take some rest days. And what better time to do that than during the taper, right? Well, it's really a hamstring issue that I'm going to have to address once back from CO, but in the meantime all I can do is maintain. I did have a successful 2.5 mile run this morning without issue and that's just what I was looking for. I got a fancy voodoo Rock Tape do from Dr. Heddles at Active Body Chiropractic again yesterday and besides looking like a BAMF, it feels good, too. The taper demons are out in force and are resting atop my shoulders. Where is my freakin' angel to counter-balance these demons?! It's been long enough since I sufficiently psyched myself out for a race that I've forgotten all the mind games that go on in the days leading up to it. Since it was quiet at work today, there was ample time to...fester. Here's hoping tomorrow picks up the pace a bit so I don't have time to do that! 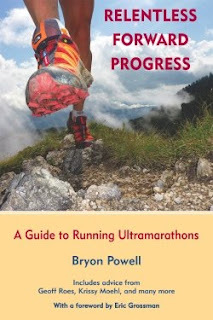 I do think a lot about how much stock we, as ultrarunners, put into single races. Not everyone is like this, but a lot are. And everyone deals with it differently. It's not a pressure, per se, but it's a definite feeling of something akin to that. You put in all this time and energy and hard work towards this singular goal, and all you can do come race day is...hope for the best. It's scary! But, that's yet another reason why I do it. It's so uncomfortable and takes me so far outside myself, yet it carries with it this intense feeling of accomplishment. An excruciatingly beautiful experience. Who are we if we don't put ourselves outside our comfort zone every now and then and dare to experience life outside of it? It is officially Leadville taper time. Where does time go? Just 10 weeks ago, Geof and I sat on the floor of our gate at the Tampa Bay airport, mapping out our training schedules...well, Geof did the mapping and I just made suggestions and watched him tap away on the spreadsheet :) The very next day we set out on day one of official training. Seems like it was just yesterday. It was a 16 week plan, but since we only had 12 weeks until race day, we had to make do. I think it's turned out pretty well. I mean, I have actually trained this time! I put in the time and the miles (well, many of the miles) and feel pretty good going into the taper. I put in 408.7 miles in the last two and a half months specifically towards this race, and, since January 1, it's been almost 868 miles put in with this race in mind. Wow. I likey. 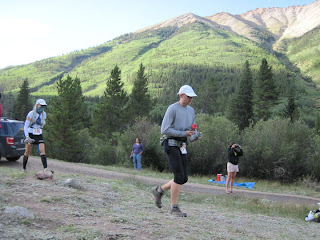 I can feel the difference going into this race, compared with my last two hundred milers. I went into Vermont severely under trained, but managed to pull through and have a great race. 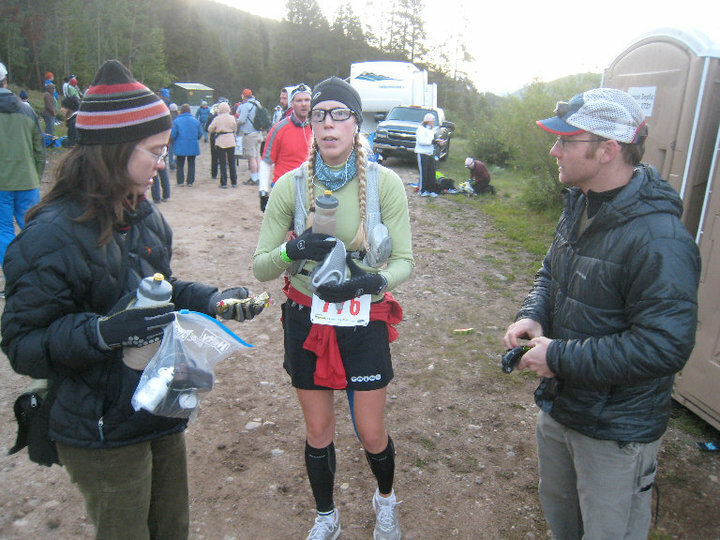 Rocky Raccoon involved one month of focused training, and only three 20 mile long runs. Suffice it to say, I was yet again severely under trained, yet somehow I got a PR by almost 45 minutes. This time, we both decided some actual training would be necessary. 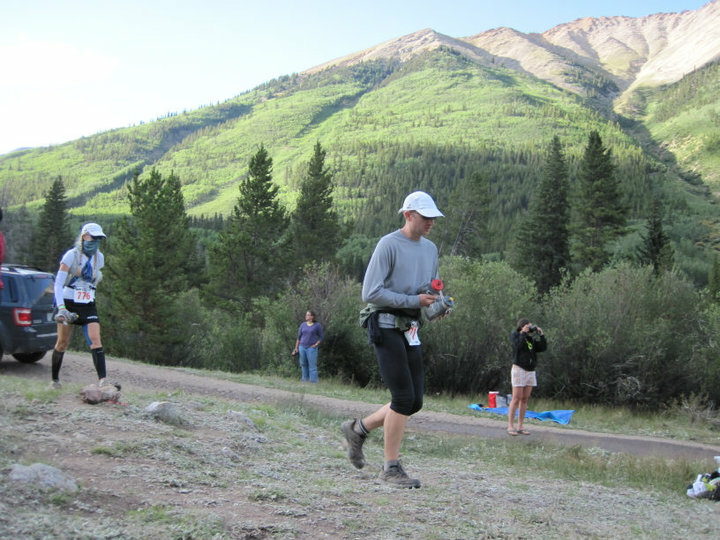 You can't cram for Leadville, and you certainly can't fudge your way through a race like that. I feel infinitely stronger going into this one. My legs almost don't look like my own; there are muscles showing that I only knew existed because of my anatomy classes ;) I feel more upright, with a stronger back and shoulders, more stable core, hips that finally do their share of the work, glutes that actually recruit. It's pretty cool. Of course, with consistent training there comes various other things to tolerate. Like fatigue, aches and pains, soreness, an insatiable appetite, blisters, blahs. My adductor (inner thigh) muscles have decided they really like the company of my hamstrings and are attached at their fascia (the casing around your muscles), literally. So that's kinda painful. Thank goodness for Dr. Heddles at Active Body Chiropractic; his mad A.R.T. skills keep me on the trail. It hurts something wicked, but it was so nice to finally have an "ache-free legs" long run yesterday, and to be able to run the ups. Speaking of that, I have no more long runs in this training cycle!! They are my favorite thing to do, but boy am I ready to just relax and let my legs repair these next two weeks. Yesterday's long run was a lesson in pain management, and a reminder that mindful running and problem solving are a HUGE part of the hundred mile experience. Rather than zoning out during my run, I remained present the entire time, which can make time sort of creep by during road runs, but yesterday I really needed to be in the moment, continually evaluating things. I had 19.2 on the schedule, and ended up finishing with 19.5, so that was good. Heading out at 11:00 put me in the heat of the day, which wasn't bad (81) since the humidity was at a recent record low (52% I believe). I decided to test out my back-up fluid nutrition for Leadville to make sure I could tolerate it, so I left the Perpetuem at home, but not without a little hesitance. I used to drink nothing by Nuun (lemon-lime), and then one day I stopped. Now I remember why. It has a lot of electrolytes in it, but it's deceiving because it's not an instant shot of them (like from a salt tablet); you only get all of the electrolytes if you down the entire 16-20 ounces of water it's mixed into immediately. I was drinking each bottle of it over the course of an hour. So, I ended up waaaaay behind on my electrolytes and as a result my abdomen was a big twisted knot of cramping. Ouch! This was good though, it reminded me about problem solving. I kept on moving, making sure not to alter my gait at all, watching my heart rate, letting my mind run and sort out the problem. At first, I didn't get it, and it was really irking me. "What have I done wrong?" I was taking in three shot bloks each hour and I was drinking plenty. Everything else felt good, stomach was fine, head was fine, legs were fine. It was just my torso, and my HR was pretty high. About 12ish miles in, it dawned on me. DUH! I'm glad I decided to bring a small baggie of S!Caps for "just in case". I took one, and within another 30 minutes, I took another one. Things slowly started to look up. I had some energy back. I dumped my bottle of Nuun and replaced it with plain water. With just 4 or 5 miles to go, I took a caffeinated gel instead of shot bloks. Whoa, that felt great and my HR finally dropped to a normal level within a few minutes! So there you go. I'm glad I tested that out, otherwise I'd have been in a world of hurt come race day. I will now go back to my tried and true back-up drink of Gatorade (the Frost kind). Yummy. It was so nice to finally sleep in today. The first Sunday in awhile that we've a) been home, and b) not had a long run to get done. It's the little luxuries :) But, this means I now have time to do the things I've been putting off...like finalizing my crew plan/instructions for our rock star Leadville crew. Yippee! 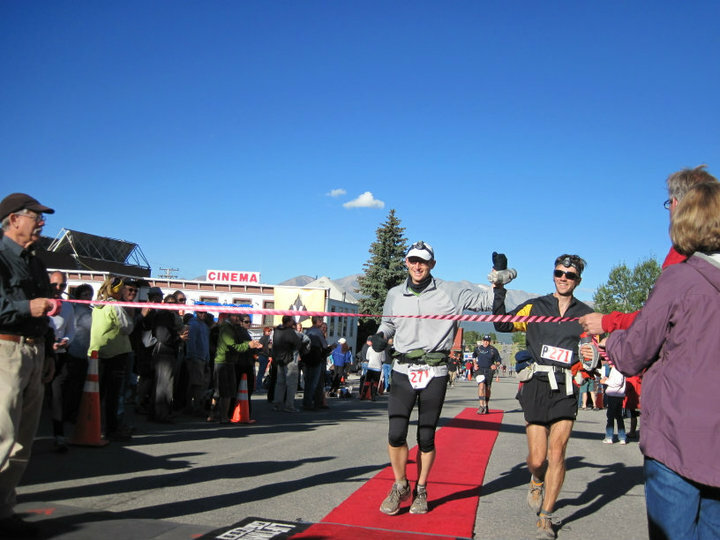 This past weekend was a final little "hooray" in Leadville Training Land. A back-to-back long run weekend. Were my legs ready for it? One would hope! Saturday was our free-est day :) so Geof and I decided to do our longest long runs that day. After some hmmming and hawing we decided to head out to Waterfall Glen in Darien, IL for our day's adventures. Since Leadville will be somewhat lacking in the department of technical single track, we decided the wide rolling graveled paths at WG would more closely mimic conditions. Bam. Geof was going for 30 miles and I had 18 on my calendar so after topping off our bottles from our delightful new water cooler, officially named the CHUG Jug, we set out running the 9.5 mile loop in the clockwise direction. We noticed we were the only peeps running/moving in this direction. It was a humid and pretty dreary day, so the trails weren't too packed, but plenty of others were still out enjoying the day. Within the first couple miles we noticed a guy stashing a Gatorade in the trees alongside the trail, then heading in our direction. As he stood up, we passed, then he moved along with us. 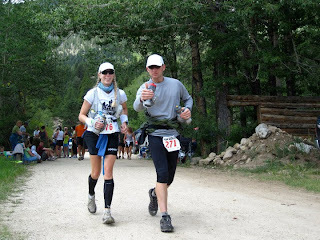 Tom, as we would find out, asked what we were running and after saying so he simply asked, "oh, well what ultra are you guys training for?" Hmm. And so it went. Tom was on his second of three loops for the day, using this run as a final decision maker for whether or not he should run Leanhorse 100. Tom was cool. He stuck with it and ran two loops with us. We learned a lot about this random stranger on the trail and it was fun to hear his stories of races and adventures' past. 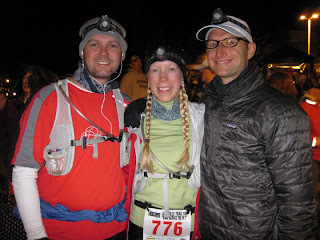 I was feeling great, especially considering we had run a tough 50-miler just 7 days prior. It was as if my legs forgot about that minor detail. Still on our first loop together, a couple approached us that had previously passed us in the other direction. They were curious about Geof's Badwater shirt. Beth and Rob ended up joining our little impromptu group run and ran 4-5 miles with us before turning back to head for their car. 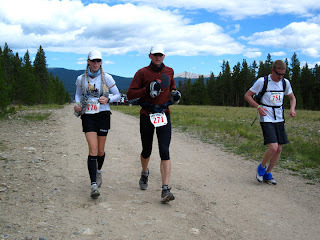 They were cool, too :) Both are marathon runners and were verrrry curious about our ultra world. Perhaps we'll see them at a CHUG event soon! Loop 1 ended and we all refilled bottles, pottied, grabbed more gels and then headed out together again. This time we ran the loop counter-clockwise. My legs felt even better than they had at the start of the first loop. I can dig that! I was drinking from a bottle of plain water, and a second bottle of Clip2. I wanted to change things up a bit, and didn't want to futz around with salt caps. It doesn't taste very good, but at least the bad taste is very dull. The drink worked well, though, as my stomach felt marvelous the whole run and I never had any puffiness in my hands. I can dig that, too. Before too long, we shut down loop 2. Tom peaced out and gave Geof his e-mail so that we could keep in touch, I cleaned up at the water pump in the parking lot, pulled on my RecoFIT leg sleeves and propped my feet up on the dashboard to begin the recovery process. Geof refilled the bottles and headed out for one final loop on his own. I got in 19 miles and felt no worse for the wear. In fact, I felt awesome! What a fun, and totally random, day on the trail! I was in awe of how good things felt. And, before I knew it I was done. I could have kept going and going and going. But there was a smoothie at home calling my name! So, 31 miles in total for the weekend, a decent amount for me. Who am I kidding, that's huge! I was pleasantly surprised by my legs and how well they held up. This is the kind of thing I need to know going into a race like Leadville...that my training hasn't all been in vain. That's a good feeling. Another good feeling? Green olives stuffed with gorgonzola cheese. Whoever invented such a pairing should be given the Nobel Prize. Tapering has techinically officially begun. Just one final long run this Saturday and then it's coasting into the starting line from there!